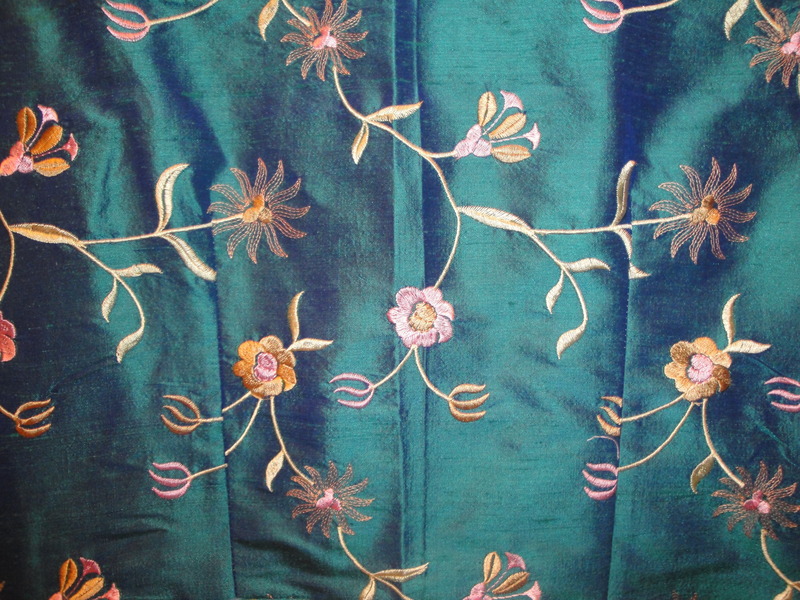 Years ago I saw a beautiful coat at Badminton Horse Trials – I was enchanted, so I ended up parting with quite a lot of money for a coat that I often get out of the wardrobe just to stare at… I’m sure you will agree the material is gorgeous, teal is my favourite colour. I felt so inspired by my gorgeous coat that I just had to make a card with the same colour scheme. I’ve been waiting for the ‘Funky Flowers‘ Die Set from Waltzingmouse Stamps to come back in to stock, so when it arrived in the post in time for the Bank Holiday weekend, I felt like it was Christmas! I had some dark teal card from my local craft shop & because the Waltzingmouse Fanatics Challenge this fortnight is ‘TEXTURE’ I grabbed my Tim Holtz ‘Woodgrain’ embossing folder. (You can probably see that the card didn’t take well to the embossing folder because there are several ‘fault lines’ in the embossing, but hopefully they just add to the textured effect!). I die cut the ‘Simple Sprig‘ from Pistachio Pudding card stock (Stampin’ UP! ), then used the stamps from the ‘Two Step Floral Sprig‘ to stamp the veins on the leaves in Lucky Limeade. On white card stock I stamped the smallest flower from ‘Funky Flowers‘ in ‘Pretty in Pink’ ink by Stampin’ UP! and the stamens in ‘Tattered Rose’ ink by Tim Holtz, then I die cut them using my new dies. 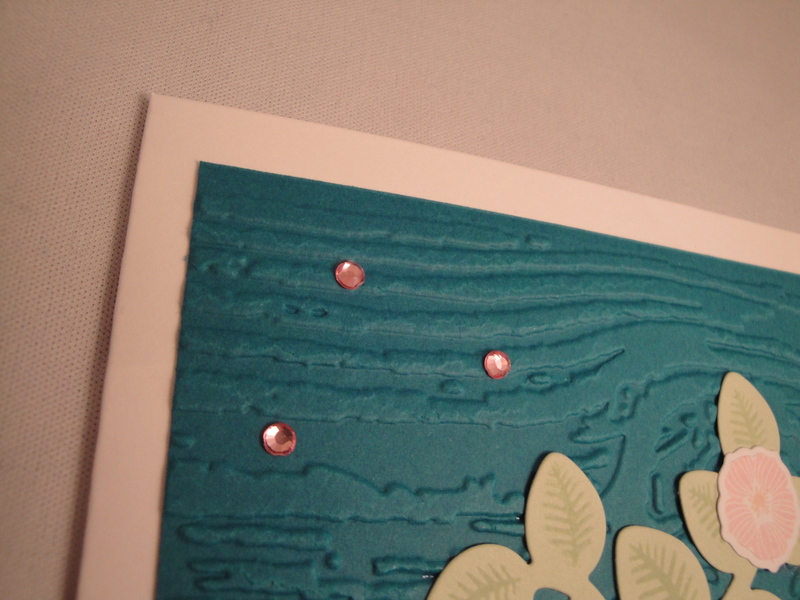 Next I attached the sprig to the embossed background with Glossy Accents, then the flowers on top of the sprig. I cut a length of ribbon to go around the teal card & attached it to the bottom of the card with double sided tape, then I attached the teal card to a white card base with double sided tape. 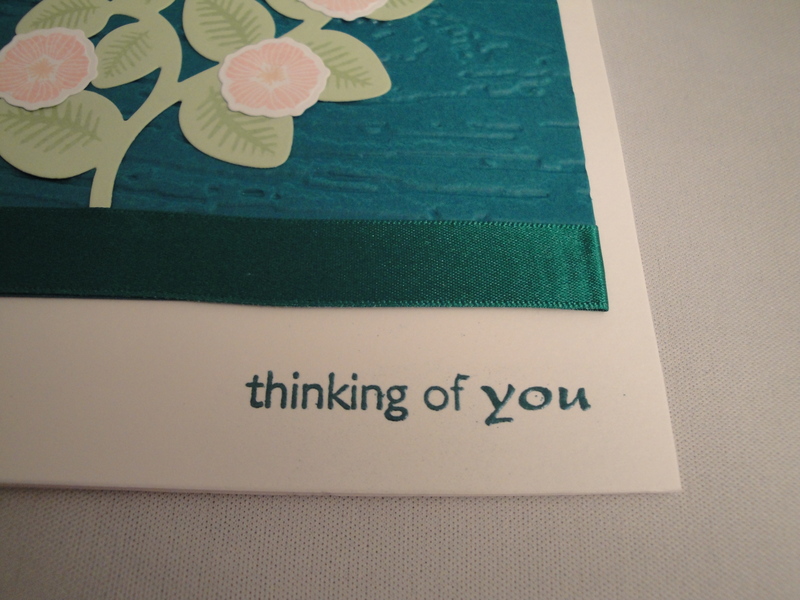 I used the ‘thinking of you’ sentiment from the ‘Asian Gardens’ stamp set from Waltzingmouse stamps with VersaMark ink & used Cosmic Shimmer embossing powder ‘Blue Watercress Blaze’. Lastly I added some pink gems to add a bit of bling. I hope you like it! I will be entering this card into the Waltzingmouse Fanatics Challenge – Textures. Previous postMum’s Birthday card – 3 months early!!! It’s beautiful fabric, not surprised you fell in love with it! 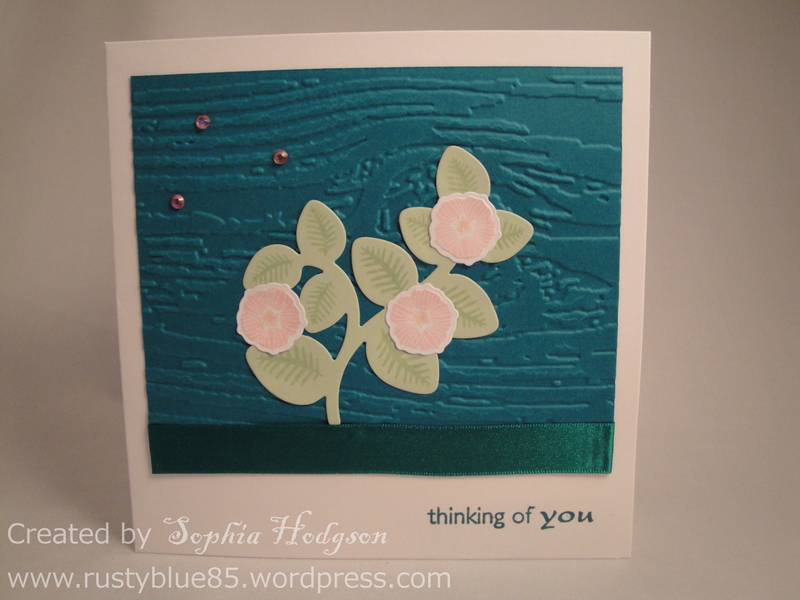 It makes a lovely colour scheme for the card too and looks great with the added texture! Teal is my favourite colour too! The coat fabric looks gorgeous, and provided lovely inspiration for your card. I like the contrast of the background texture panel and the smooth ribbon. I can see why you got the coat – the fabric is fabulous. Love the colours too, so I can see why you were inspired to make your beautiful card! The wood grain texture is fab and I love the pretty flowers. Thanks so much for playing along with Waltzingmouse Fanatics! 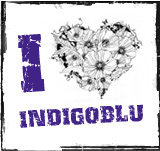 I love that you were inspired by that lovely fabric and your woodgrain sets of the stamps so well.